This is one issue of The Star, a weekly newspaper published in Stratford, Garvin County, Oklahoma. 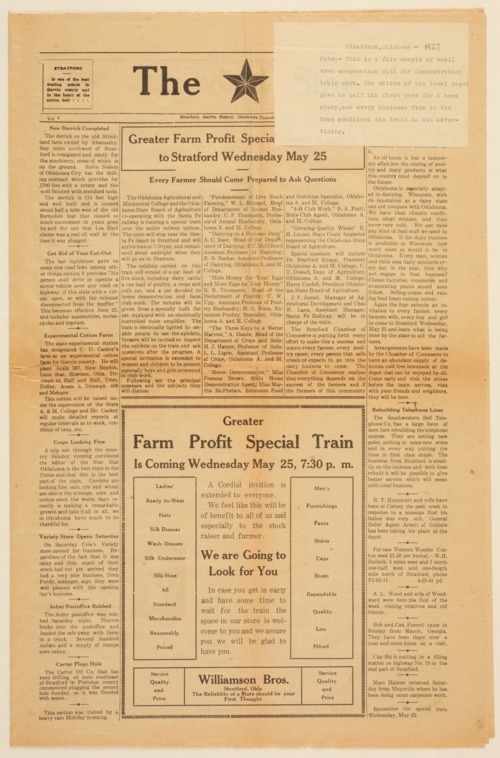 This issue contains information about the Atchison, Topeka, and Santa Fe Railroad's "Greater Farm Profit Special Train Coming to Stratford" on May 25, 1927. The front page article about the train lists the following special cars: livestock with dairy cattle, poultry, crops and soils, and one with home demonstration and farm club work. The Oklahoma Agricultural and Mechanical College and the Oklahoma State Board of Agriculture are cooperating with AT&SF on making this train available. Ads in the paper also reference the appearance of the train. The newspaper also contains local news and has columns for various small communities around Stratford.